Context: Successful job outcomes and dynamic professional trajectories are vital to prospective students. To improve outcomes, the planning process identified the need for a curriculum and programming that emphasizes a problem-solving orientation, combining professional skills and ongoing access to prospective employers with expertise in critical functional areas as well as key countries and regions. As skilled professionals, future leaders and agents of change, Fletcher graduates should be able to analyze complex situations and identify creative and mutually beneficial solutions to challenges and tradeoffs; undertake relevant research and fact finding, combining conceptual and experiential thinking, including analysis of data and broader patterns; have knowledge of the relevant historical and cultural context; be able to express themselves clearly and persuasively in their written and verbal communications; have an ongoing capacity to learn and adapt to changing circumstances; know how to inspire, manage others and execute in order to have real-world impact; and develop professional personae that also reflect their personal passions and aspirations. Strategy: To meet students’ evolving needs the School will enhance and streamline the curriculum, expand career-enhancing curricular and co-curricular offerings, diversify its academic and non-academic partnerships, and encourage innovative pedagogical approaches in the classroom. 1. The School will enhance and streamline the curriculum while maintaining its traditional areas of excellence. a. The School will introduce and/or develop curricular offerings in several areas that are growing in importance to the field of international affairs. Offerings in cyber/digital, biology/health, and Africa will be explored as a first step. The School will also seek to add offerings in leadership/management skills, Russia, India, China, emerging powers more broadly, and gender. This list does not preclude continuing to look at other areas of the curriculum that may be strengthened. The aforementioned areas are tied to some of the biggest problem-solving opportunities that will emerge in the coming years. Some of these areas (biology/health, Russia, and India) will be new to Fletcher, while others (cyber/digital, Africa, China, leadership/management, and gender) will require deepening existing capabilities. In setting these priorities, Fletcher faculty considered such factors as demand from current students, demand from applicants, demand from employers, faculty interest, Fletcher’s comparative advantage, Tufts’ comparative advantage, global importance, fundraising potential and whether an area lends itself to interdisciplinary study. In line with the School’s strengths, the offerings in cyber/digital and biology/health will focus on the international and governance dimensions of these issues. These two areas cut across Fletcher’s curriculum, and their development will have an added benefit of strengthening existing fields of study. While growing the curriculum in these areas could have hiring implications, Fletcher should seek to leverage its relationships with partners wherever relevant. 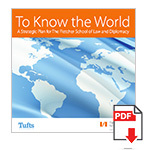 Such partners include first and foremost other parts of Tufts University (for example, Tufts health sciences for bio/health; the Gordon Institute for entrepreneurship; and the School of Arts and Sciences for cyber/digital, select regional expertise, and foreign language study); partner universities (both US and international); and non-academic partners, including think tanks and foundations. The Academic Council will prepare a report on hiring priorities by summer 2015, which should be driven by curricular and research priorities as well as a review of alternatives available through partnerships. b. The School will prepare and communicate three readily comprehensible courses-to-competencies matrices for existing courses. The three matrices will identify i) the professional competencies, ii) geographies and iii) functional areas covered by the curriculum. The matrices will aid in curriculum development, guide students in course selection and demonstrate to prospective students the richness of Fletcher’s offerings. They will help to “connect the dots” across multiple courses and match competencies with career paths. They will show where Fletcher faculty’s collective strengths lie and give a sense of the curricular components Fletcher could leverage to develop new areas. The matrices will also aid in identifying key gaps and redundancies. A staff member will be tasked with preparing the matrices in winter/spring 2015. The competency matrix will map Fletcher courses to approximately ten skill areas, such as communication, negotiation, management, data analysis and gender analysis, among others. Similar devices will be prepared for regions and functional areas. c. The School will integrate more opportunities for hands-on learning into courses. Faculty may do this through greater use of practicums and simulations, some of which could be led by external practitioners and mentors (including alumni) from around the world. d. Informed by the three courses-to-competencies matrices, the Academic Council will adapt its mechanism for adding courses to also include removing courses. The Council will develop a set of criteria for removing courses, which should include, but not be limited to, course evaluations, enrollment numbers and redundancy within the curriculum. 2. The School will expand career-enhancing co-curricular offerings. a. The School will provide more opportunities for experiential learning. This could be done in a number of ways, including by offering not-for-credit workshops on topics ranging from professional writing, to systems thinking and big data. The Initiative for Women’s International Leadership (IWIL) has underscored a need for programming that would better-enable women graduates to reach positions of leadership. We will also consider “Fletcher on the Road” educational trips; an annual, School-wide global public service project; “Fletcher in Washington” programming; and so on. August and January pre-sessions could be used for experiential learning programming. PhD students could lead some of these co-curricular, skill-focused offerings. b. The Dean’s Council will consider creating a new Director of Student Professional Development who, working with faculty, staff and centers, would oversee integration of curricular and extra-curricular activities at Fletcher and with our partners. The Academic Council would weigh in on the terms of reference. This will lead to better integration of internships, field research, practicums and capstones, deepening the students’ educational experience. 3. The School will diversify its partnerships in line with our strategic objectives. a. The Fletcher School has a number of academic partnerships in the form of joint degree and exchange programs. While the number of students involved is small and impact on revenue minimal, these programs bring capable students to us who would not otherwise seek a Fletcher degree, while providing Fletcher students the opportunity to deepen their regional, functional and professional expertise. We will rationalize these partnerships, paying special attention to geographic diversity and the professional opportunities they create for our students. This will be done by fall 2015.
b. In addition to these academic partnerships, the School benefits from relationships with think tanks, non-governmental organizations, foundations and corporations. These non-academic partnerships create opportunities for students in the form of internships, practicums and policy-oriented research projects. The School will continue to establish these partnerships on an ad hoc basis, while also looking to formalize some in memoranda of understanding. A near term priority will be a partnership with a think tank in Washington, D.C., by fall 2015. The School will also leverage its Boston location to enhance relationships with multinational corporations, foundations, conflict resolution and international development organizations. c. Over time, we will establish additional institutional partnerships in locations that are of strategic importance to Fletcher. d. In reviewing existing and establishing new partnerships consideration will be given to benefits they provide over and above the academic and professional preparation of our students: having a Fletcher presence in strategic locations, facilitating research collaboration and impact, and expanding our executive education programs to new constituencies. 4. The School will encourage innovative uses of technology in order to enhance student learning. Technology-enabled pedagogical approaches include “flipped” classrooms, “connected” classrooms, video links with external experts and constituencies, among others. “Flipped” classrooms enable students to get more out of the time spent with instructors, while the “connected” classroom collapses distance to bring in diverse perspectives. The School has piloted the use of these approaches, which will enable it to develop best practices for future courses. 1. A model in which students watch lectures on their own time and focus on discussing or applying the material in class. 2. A model in which students in two or more locations learn and work together.